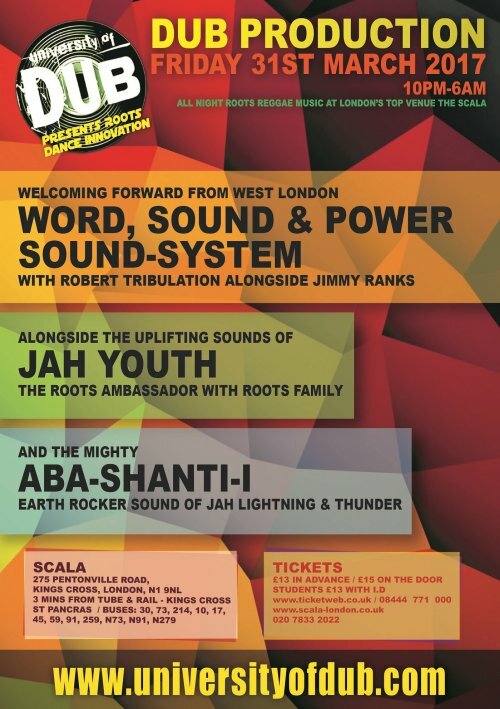 University of Dub’s monthly sessions are held at the Scala in King’s Cross, which is situated in the heart of London. 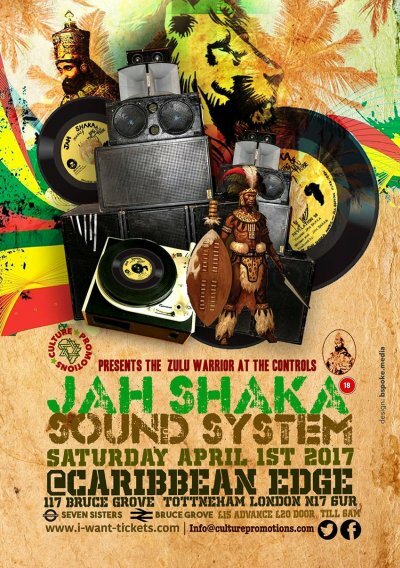 The monthly sessions feature three heavy weight sound-systems playing roots reggae music and special dub plates. 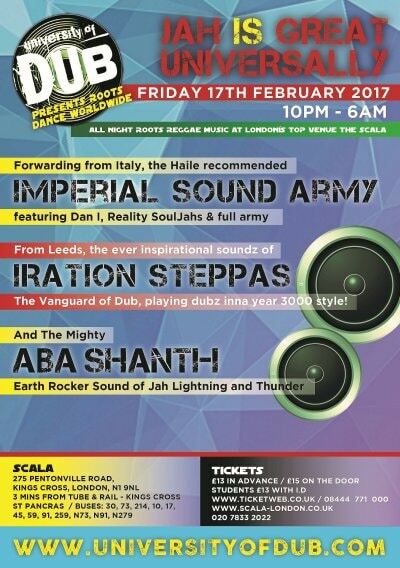 The vibration in the dance is a togetherness of all nations enjoying high quality roots reggae music. Come and enjoy Jah vibes! 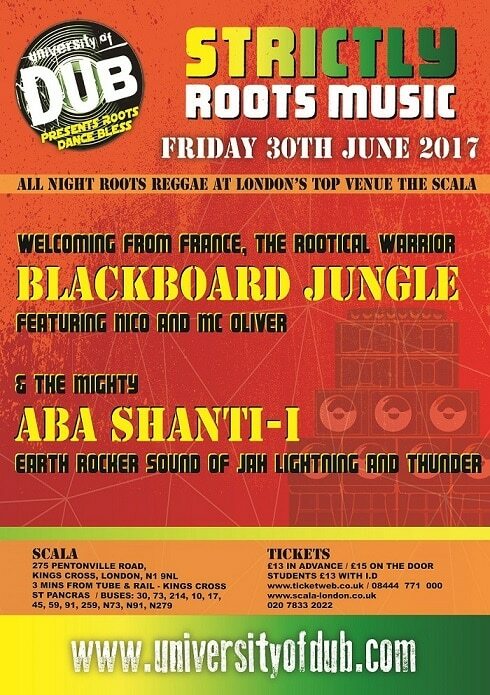 University of Dub presents Roots Dance Rockers. Friday 26th May -10pm – 6am. 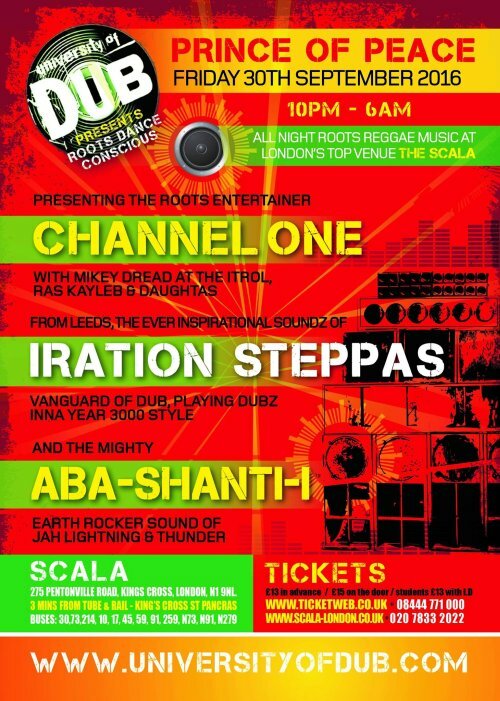 The Vanguard of Dub, playing dubz inna year 3000 style! 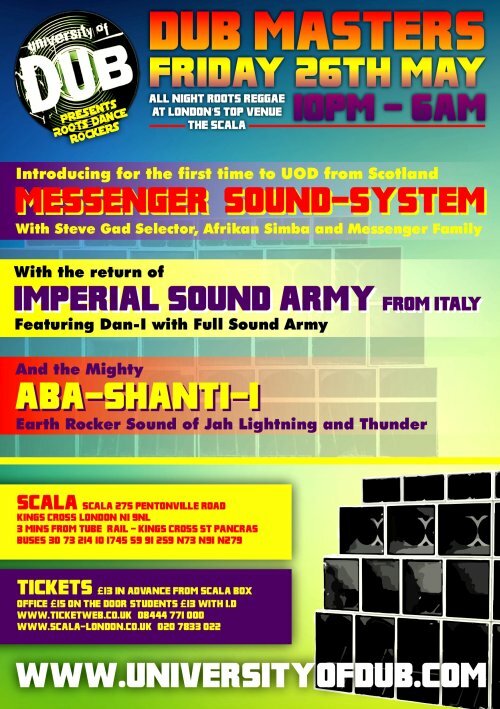 University of Dub’s monthly sessions are held at the Scala in King’s Cross, which is situated in the heart of London. The monthly sessions feature three heavy weight sound-systems playing roots reggae music and special dub plates. The vibration in the dance is a togetherness of all nations enjoying high quality roots reggae music. Come and enjoy Jah vibes! Back by popular demand, Adrian Sherwood returns to the Jazz Café for a night of rare and special performances, which follows the rapturous party atmosphere of the first live show/club night, which celebrated the release of the critically-acclaimed On-U Sound compilation ‘Sherwood At The Controls Vol. 2’. Absolutely unmissable for all discerning dub-heads, Sherwood At The Controls will centre around a one-off, all-star live performance of music from Joe Gibbs and The Professional’s seminal, classic albums ‘African Dub 1, 2 & 3’. British reggae, dub and lovers rock master Dennis Bovell will play bass, joined by Creation Rebel guitarist Crucial Tony and Perry Melius – the drummer from the classic line-up of African Head Charge. Adrian Sherwood will be dubbing the set live in his usual masterful fashion. The night will also feature a special rare DJ appearance from both Matt Black and Jonathan More AKA Coldcut – the legendary duo who’s sample heavy, hip hop-influenced productions were integral to the late 80s dance music explosion, birthing their own hit records, plus remixes and productions for Eric B & Rakim, James Brown, Queen Latifah, Steve Reich, Blondie, Pierre Henry, Nina Simone and BBC Radiophonic Workshop. Equally noteworthy is Ninja Tune, the label founded by Coldcut, which – akin to On-U Sound – has remained at the pinnacle of leftfield, dub and beat-based music over the decades. In addition to essential records by Actress, Run The Jewels, Floating Points, Bonobo, Kelis, The Bug and Helena Hauff, Ninja Tune will be releasing a limited-edition, hand-made single by Coldcut X On-U Sound (more details TBA). Since the first Sherwood At The Controls Live at the Jazz Café earlier this year, the release schedule for On-U Sound’s inspirational and influential music has continued apace, with the African Head Charge box set and 8-track vinyl LP of unreleased tracks – entitled ‘Environmental Holes and Drastic Tracks’ and ‘Return Of The Crocodile’ respectively. Also recently released was a vinyl re-press of the aptly-titled album ‘Staggering Heights’ by Singers & Players, plus ‘#6’ – a new 12” by Japanese krautrockers Nisennenmondai (featuring a remix by Chris Carter of Throbbing Gristle fame). Additionally Sherwood & Pinch recently contributed the track ‘Retribution’ to the Houndstooth records ‘#savefabric’ compilation. 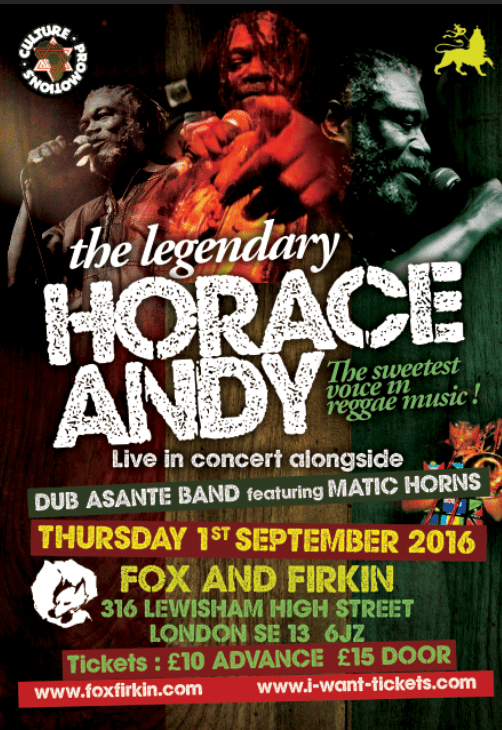 HORACE ‚ SLEEPY’ ANDY sings his catalogue of hits alongside the Dub Asante Band featuring Matic Horns. Fox and Firkin, 316 Lewisham High Street, Londo SE13 6JZ.